Busy, 4G LTE provider of the year for 2016 has unveiled its new operational strategy, with a tremendous focus and commitment towards empowering Ghanaian youth, entrepreneurs and SME’s. The 4G operator, who has a new brand promise of Great Things Happen, is positioning itself to become the #1 next generation 4G operator in Ghana, by championing the youth empowerment agenda. The new outlook aims to further establish Busy as the hub for young people and up-and-coming entrepreneurs, where they can connect to the world, develop business plans, network, and kick-start their dreams. Chief Executive Officer of Busy, Praveen Sadalage, says “Busy is shifting its focus to one that is youth-centric and digital first with the introduction of mobile digital platforms such as MyBusy Mobile App, an interactive platform that allows customers to track their data usage, top up data, bundle data and control their data usage. There is also the Web self-care platform, which allows customers to interact with Busy on their laptops or desktop,” he said. 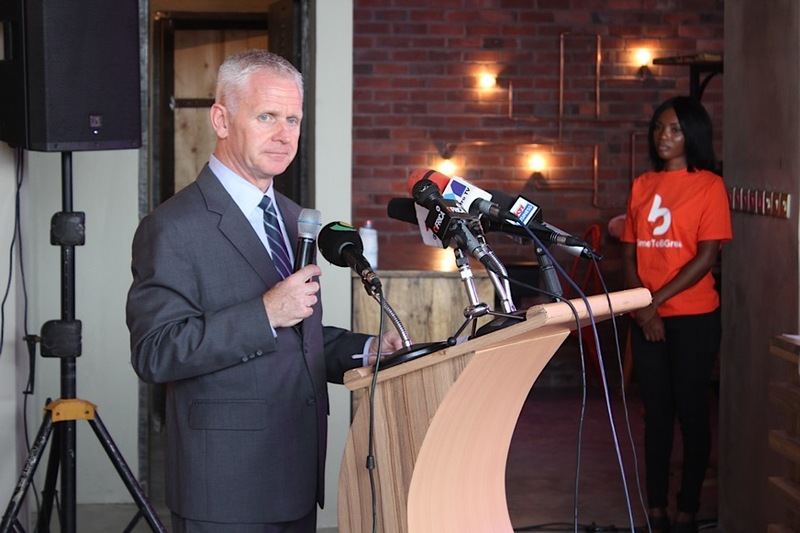 “When we launched our three-pronged youth strategy with the unveiling of our JUMP platform at the end of last month, it was to signify our intentions to operate in a space where most of Ghana’s population is; and to offer them an incredible access to materials that will ensure their professional and individual growth, this strategic shift further accentuates that initial commitment,” the CEO added. 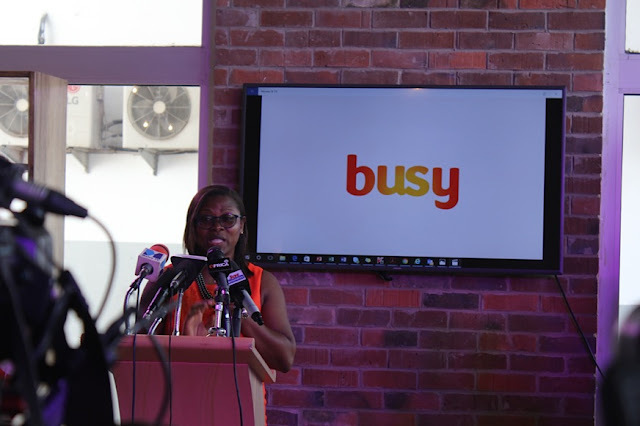 Chief Marketing Officer of Busy, Michael Fitzpatrick disclosed at the launch in Accra that Busy will also be launching a new mobile interactive app known as Chat+. This will be free for all Busy customers as it will allow them to chat, call, share pictures and videos with friends and loved ones. In line with this new vision, Busy is rolling out some innovative products with the customer at the centre. It is our desire to get closer to our customers; hence, we have opened our new multi-functional flagship store which will have a collaborative work space at the back for young entrepreneurs, to come and experience our 4G WI-FI. 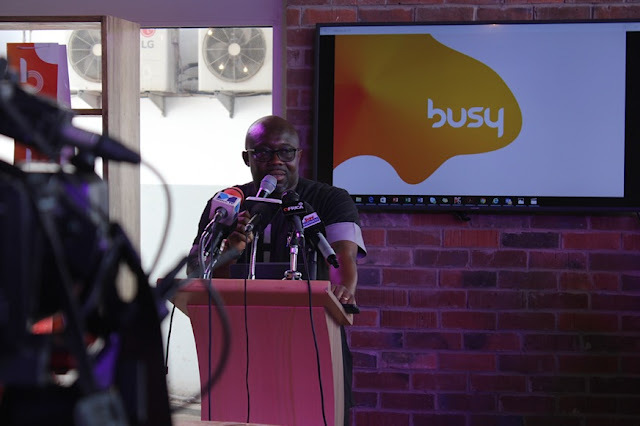 The Deputy Communications Minister and Member of Parliament for Awutu Senya West, George Nenyi Andah who relaunched the revamped Busy brand and opened the flagship store urged Busy to lead the way in delivering affordable and reliable data for the youth segment in particular. Mr Andah said “Our young ones need data for their studies and businesses; but do not have the financial wherewithal; Government is in the process of ensuring that some of the factors that tend to slow down the growth of businesses like data are permanently solved so there is a phenomenal growth in that sector which will result in opening up employment avenues for the talented Ghanaian youth who have had artificial barriers forestalling their growth”, he said.